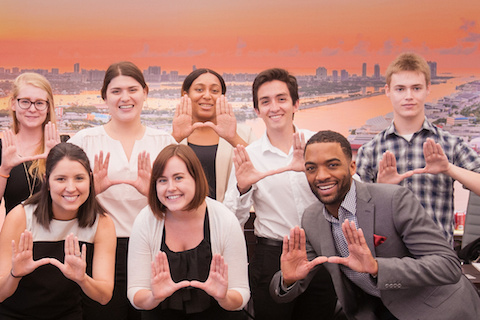 UM students on the inaugural Miami Career Crawl show their school spirit. Where will U live and work after graduation? Discover what it's really like to live and work in cities of interest to you by engaging in Career Crawls, immersive trips that allow you to explore career paths and connect with that city's UM community through employer site visits, receptions with alumni, and more! Career Crawls take place in a variety of domestic and international cities, and are focused on specific industry themes relevant to that location. Why should you be excited to participate in a Career Crawl? Visit local employers on site: Experience their work environment and company culture firsthand. Learn about current and emerging career paths in that organization and industry. Engage in interactive activities designed to give you a feel for their work. Meet UM alumni: Get answers to the questions you’re eager to ask: How did they find employment and make connections in that city? What was the most challenging aspect of their transition from Miami? How much does an apartment in the city really cost? Enhance your career readiness: Hear advice on what you should be doing NOW to successfully transition to that city’s workforce after graduation. Gain insight into the skills and qualities that will make you stand out to employers. Reflect on how your Career Crawl experience has shaped your professional development. Ready to pack your suitcase? Here’s what you need to know about participating in a Career Crawl. Career Crawls are open to current University of Miami students of all schools/colleges who are classified as sophomores or juniors at the time of the Crawl. You must be in good academic and disciplinary standing. Links to specific application instructions for each Career Crawl will be included in “Upcoming Career Crawls” above when the application process for that Crawl opens. Applications are completed online and include short answer questions focused on why you are interested in participating and what you hope to gain from that Career Crawl, as well as a resume submission. For some Career Crawls, you will also be asked to conduct a brief presentation. Between 15-20 students are typically selected for each Crawl. If you are selected to participate in a Career Crawl, you will need to pay a $100 administrative fee in order to secure your spot. All other costs for Crawl activities (flights, hotels, local transportation, meals) will be covered by the Toppel Career Center and our partners. However, don’t forget to bring spending money for souvenirs or other personal expenditures!